Description of "A Silent Figure"
Who is a great story-teller? Suppose there is a man who cannot speak – totally dumb. But sometimes in life, people who cannot speak teach us so many things which we don’t learn anywhere else. Sometimes even blind persons make us see those things what we don’t see in our whole life. A Silent Figure is also such a wonderful story piece. A collection of 15 simple yet unique stories that will drench you in the rain of love and emotions. It regenerates the lost humanity and faith in the readers through heart-melting episodes. And it will take you to your youthful time, where you will find yourself as a beautiful deer running over and there to quench the thirst of first immature love. So, enjoy this new journey of love, faith, hope, kindness and joy. Welcome to A Silent Figure! Gaurav S Kaintura was born in New Delhi. 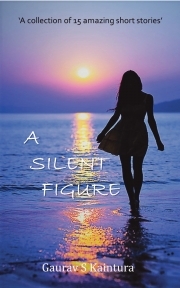 His debut book 'A Silent Figure' is an amazing and unique collection of 15 short stories. He is currently pursuing his B.tech degree in Computer Science from a reputed University. He wrote his first short story at the age of 15. He is a voracious reader. His favorite authors are Ruskin Bond & R K Narayan. Gaurav lives in New Delhi & write poems and short stories in his free-time. You can get in touch with him on Instagram @gauravsk98. Reviews of "A Silent Figure"